Happy Friday, friends!! I am on the hunt for a new dining room table and am so tempted to build my own. I have the mental and physical tools to do it so I am seriously contemplating it! We already have a table that is beautiful and embarrassingly expensive. It is from the dining room of our old home when we had an actual dining room and it filled that space beautifully! The art in the room. Now we have an open floor plan. The kitchen is the dining room is the family room and I no longer want a formal dining room table with its grand chairs and provincial lines and curves. It is absolutely stunning….in the right setting. It needs its own room to be displayed as the centerpiece of that special space. Not to be a homework station/catch-all for anything someone intends on picking up later. So, I want to allow it to live in someone else’s space to be displayed in a proper setting. One of fancy dinners and silverware that only comes out on special occasions. Much like this photo, the way we live has changed over the last few years and I would like our home to reflect that. I also have a gorgeous crystal chandelier from our dining room that I hauled with me for years until I had the right spot to put it in. When I disassembled it, I made a diagram and assigned a letter to each row of crystals. I then wrapped each crystal individually and marked each little package with the corresponding letter to that row. At the time of moving it was very tedious but I am so glad that I did that. It made assembling the chandelier back together so easy! 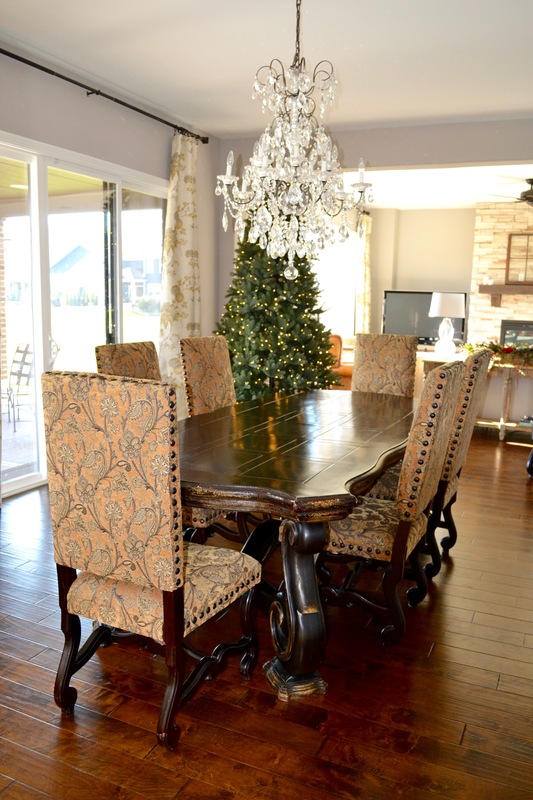 The chandelier now sits in our dining space over the too formal table. It is formal, too, but I don’t mind its formality. It brings interest and life to our meals and cascades rainbows across the house when the sunlight hits it just right. It is one of the things the kids remember vividly from their childhood an about this chandelier in particular so I couldn’t leave it behind. And if we ever move, I will do it all over again. We have these jug lanterns in the kitchen. They lend a nod to the classic, timeless elements in our kitchen of subway tile and white shaker cabinets. They are chrome and don’t match the chandelier or the appliances or the hardware in the kitchen but it all just fits together. I am a firm believer in making your home collected over time. Making it your HOME. Where all the things you love find their place….people, pets, keepsakes, treasures you found in little shops and decor, old and new. It all plays together beautifully and tells a story. The story of your life. As much as I love this romantic story about the wood #swoon I do need to consider all things. Like dollars. So I still may build. Like Restoration Hardware, I procured a little something myself. I found my favorite DIY tables to share with you all from my favorite gals who love to do what I do and have inspired me for many years. Check out this post for all of my faves. These are all my favorite tools that I have purchased over the last couple of years that will help with the success of any project I decide to do. Whether it is a table or an entertainment center…I am ready! What is the one tool you couldn’t live without?